Don’t let the title fool you. Preppy Princesses we are not. The last time we attended Charm School it was vicariously through Miss Mo’Nique’s class. However, that never stopped us taking a tip from the playbook. 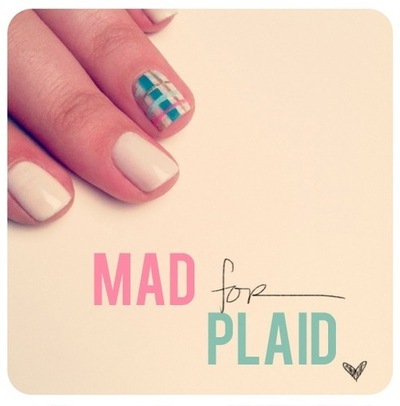 Given its no secret the hottest fashion houses are Mad for Plaid we decided to give this style trend a new spin and our mani a hint of preppy pep. Ready to give your ho-hum mani the finger? Then Let’s Do The DIY Thang, shall we! First, grab you some scotch tape, cuticle scissors or a tiny pair of the like, tweezers, your favorite 4 shades of polish, a base coat color and a clear top coat. Take your accent colors and paint stripes of each on to the scotch tape. Then paint your base coat on all nails and let dry completely. (Dont use a ‘flash dry’ otherwise the stripes for your plaid won’t stick; leaving your nail looking more ‘DIY-saster’ rather than ‘DIY-tastic’) Cut the painted piece of tape in to various sized strips. Use the tweezers to pick up & place each strip on the accent nail, starting from the inside corner moving outward, alternating between vertical and horizontal direction of strips each time. Continue this until you’ve reached the opposite corner or until your desired level of plaid is achieved. Use the cuticle scissors to trim the edges of the strips and cover the nail with a clear top coat of polish. TAAADAAA! Accent Nail Perfection Achieved! The coolest part about this DIY Ditty is how completely customizable it is. So whether you’re Grunge Rock’s Punky Brewster or Miss Teen Sweet Valley High, you can totally rep your set with this nail masterpiece and all without having to relive the angst of yesteryears. Halle-FREAKIN-lujah!